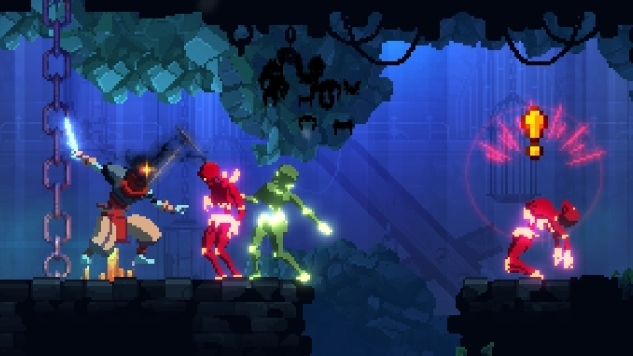 Dead Cells , from worker cooperative Motion Twin studios in France, recently launched on the Nintendo Switch, right when it left Steam’s Early Access for it’s official 1.0 release. And I cannot stop playing it. It’s smooth, fast, and the deep combat keeps you from ever getting bored with a strategy. The way that the game doles out new weapons always keeps you agile in your strategies—each shiny drop always a little better than what you’ve got, but varied enough that to pick up a valuable found item could force you into a wildly different playstyle. Halfway through successful runs I would find myself switching from a sword-n-board loadout to a turrets-and-bows kit, because I happened to find a run of good weapons. Every run feels new, and part of what keeps the game feeling so fresh is the sense of progression between runs. Making it through even the first level will net you a crop of cells, a meta-currency in the game used to unlock permanent upgrades between runs. Even if I have a bad run and find myself dead in the second level (usually from falling on spikes… damn those inconveniently placed dungeon spikes), I’ll still have already invested my earnings from the first level into any number of possible upgrades for my smarmy, silent sword boy. Because of this, the game never feels like it’s outpacing you. Grinding is minimal, and even when you do find yourself just playing for the cells, the randomization within level layouts means that each new run feels like a new challenge. Coupled with the aforementioned focus on weapon variety (once you unlock new weapon types) and tight combat means that Dead Cells has quickly become my game of choice for quick play-sessions. Just drop in, hack away at a couple skeletons, and know that I’ve made some progress that affects my entire playthrough. This sort of progression mechanic isn’t unheard of in modern rogue-like-like-likes, but it’s nonetheless one of the design tricks that I find extremely enticing. In many ways, Dead Cells feels like it’s following in the footsteps of a game like Cellar Door Games’ Rogue Legacy, another action-focused rogue-like with an emphasis on meta-progression between runs. After each death you could spend your earnings on permanent upgrades to your character and your possible abilities. And, like Dead Cells, I found myself pretty much playing that game daily for weeks on end. Both Rogue Legacy and Dead Cells scratched that same itch for me: that even if one run ends up badly, I still contributed to a greater victory by dropping a few coins into something that will help me in the long run. It’s like gardening—you don’t see the results until the end, when the upgrades start blooming on the battlefield.